Pocono Raceway and the Pennsylvania Turnpike are hosting a job fair on June 1 from 8:00 a.m. to noon. The fair will take place at Pocono Raceway's Chalet Village located behind the grandstands and participation for companies is free. If companies would like to park a branded rig (cab only) in the job fair grounds, they may do so for $500 but spots are limited and will be reserved on a first-come, first-served basis. Companies that participate will receive six free tickets to the NASCAR Xfinity Series race that afternoon. For more information on the event, click here. To register, complete this form and return it to Christina Rodis-Durst, the Partnership Sales Manager at Pocono Raceway. Drivers looking for companies must present their CDL to gain entry to the job fair. Parking and admission to the fair is free and job seekers that attend will receive two tickets to the race as well as a $10 credit at the concession stand, courtesy of PA Turnpike. For more information, visit www.poconoraceway.com/trucking or call 1-800-RACEWAY. The ATA Technology & Maintenance Council holds a National Technician Skills Competition (“Supertech”) each year to recognize the skills of diesel truck technicians around the country. This event is supported by those states that have launched their own competitions. Although Pennsylvania does not currently have a competition, Maryland does. PMTA has worked out an arrangement whereby any Pennsylvania based technicians can compete in Maryland’s competition. If at least 5 techs from Pennsylvania compete, the winner will be recognized as the Pennsylvania champion and eligible to compete at the national Supertech event. What is Supertech Maryland? A hands-on contest where technicians gather to test their abilities against their peers. It showcases the knowledge, training and skill needed by today’s maintenance professionals. When & where? Saturday, June 22, 2019, Center for Applied Technology – North, Severn, MD; 7:00 a.m.
Who can participate? Any truck technician in Maryland or an adjacent state without its own competition. What can you win? Winners receive over $5,000 in cash and prizes such as tablets, trophies, a trip to the national TMC competition and more. All contestants receive lunch, an event t-shirt, and a goody bag. How do I enter? Go to http://www.mmtanet.com/files/2019SuperTechASEpacket.pdf or call 410-644-4600. The entry deadline is May 31, 2019. For more information, call Maryland Motor Truck Association, 410-644-4600. Motorists should avoid I-895 and use I-695 and I-95 as alternative routes. Motorists also should pay attention to electronic and static signs for up-to-date travel information. To sign up for email/text alerts or view real-time traffic camera images on MDTA roadways, visit mdta.maryland.gov. CAMP HILL, Pa. – The Pennsylvania Motor Truck Association is excited to announce that hotel rooms at Toftrees Resort for this year’s Annual Membership Conference have sold out. In response to the high level of interest in attending the event, PTMA has secured more rooms at the Holiday Inn Express less than one mile away from Toftrees. There will be a shuttle available between the two hotels for the convenience of AMC attendees. The 2019 AMC is just five weeks away but there is still time to register for the event, which will feature speakers from the American Trucking Association, XM Radio host and former NFL Lineman Ross Tucker and others, in addition to some excellent vendors. Click here to claim your spot at the conference. CAMP HILL, Pa. – The Pennsylvania Motor Truck Association is excited to announce Ross Tucker as the keynote speaker for the 2019 Annual Membership Conference and Expo, taking place at Toftrees Resort in State College May 16-18. Tucker, a native of Wyomissing, Pa., played seven seasons in the National Football League as an offensive lineman after playing four years at Princeton University. He was a second-team all conference selection in 2000, a two-time Academic All-American and was named to the 2003 All-Joe Team by USA Today. 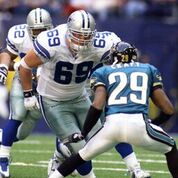 In his time in the NFL from 2001-2007, Tucker played for the Redskins, Cowboys, Bills and Patriots as well as a stint with the Browns on their practice squad. He played in 42 games, starting 28 of them, before retiring in March of 2008 due to a neck injury that bruised his spinal cord. Tucker turned to a career in the media after retiring from football and is currently a columnist for The Athletic, a host of both The Morning Kickoff and The Opening Drive on Sirius XM NFL Radio and a game analyst for CBS, NBC, ESPN and Westwood One. Ross is the host and owner of the highly successful RT Media Podcast Network which includes his flagship Ross Tucker Football Podcast. In 2007, while still a member of the Washington Redskins, Tucker co-founded and is still the CEO of GoBigRecruiting.com. Go Big allows student-athletes to submit their profile information and videos to colleges online and receive notification when it has been reviewed. He’s also involved in other Pennsylvania-based start-ups like MyFrontPageStory.com and BallCannon.com. Tucker, along with his wife and two daughters, currently live in Harrisburg. The 2019 AMC will conclude on Saturday May 18 with Tucker’s presentation. He will be available for a meet and greet that morning at 10 before taking the podium at 10:30.